Silverstone Auctions’ sale at held during the Silverstone Classic weekend between 23rd to 26th July promises to be one of the most exciting classic car auctions this year, featuring a mouth-watering collection of classic cars for sale. A range of iconic road and racing cars is set to be auctioned in the biggest-ever Silverstone Classic sale by Silverstone Auctions featuring a host of some of the finest classic cars from the Seventies, Eighties and Nineties. Let’s have a look at some of the star cars on going under the hammer this weekend. This 964 RS in N/GT Lightweight Specification car was allegedly given to Ulrich Richter, an Eighties Porsche-only racing driver by the Porsche factory (picture above). Rumour is, the gift was to entice Richter back into GT racing and (if true) it certainly worked. He came third at the 1994 Daytona 24 hours driving a 911RSR. The Maritime Blue RS was customised for him for use at his favourite circuit, the Nurburgring. He sold the car in 1993 and it arrived in the UK from Germany on 1 November 1995 having covered just 30,000km. Since then the car has been pampered and preened. With an engine rebuild by Porsche specialists Ninemeister in 2005 and a suspension and braking system overhaul in 2006 and a full glass-out paint re-fresh in 2008. 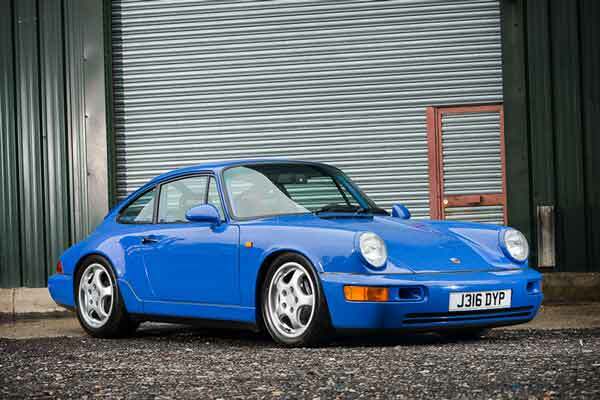 The car comes with a complete service history, a Porsche Letter of Authenticity and an original 964 RS owner’s manual. Estimate £230,000 – £260,000. 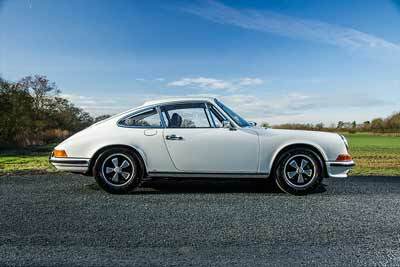 Another immaculate, highly sought-after Porsche starring at the Silverstone Classic sale is this 1972 911 2.4S Coupe. This LHD matching numbers car (backed up by a Porsche Certificate of Authenticity) was first registered in March 1972. Presented in its original Light Ivory with a black interior and period Fuchs alloys. Built for the Italian market, the car spent most of its life in Paris, before being imported to the UK in 1997 with just 69,000 miles on the clock. After an engine rebuild in 2001 (16,000 miles ago), a rolling road test in 2006 revealed this perky Porka was still producing 196bhp. The car has covered just 5,000 miles since a gearbox overhaul by Autofarm in 2012. The car also features the correct period Blue Spot radio and Recaro sports seats. Coming with an extensive history file, this extremely sought after 911 carries an estimate of £130,000 – £150,000. See both cars and what to look out for in this exclusive 911 Buyers video presented by Harry Metcalfe. This very special 1989 DeTomaso Pantera GT5-S could well prove one of the most muscular classic cars for sale this weekend. The car is an extremely rare original RHD UK car, one of only 17 RHD GT5-Ss out of a total production of 187 worldwide. In outstanding condition, it features Rosso Corsa paint with a Crema leather interior and that mighty Ford V8 engine that has been rebuilt and enlarged from 5.7-litres to 6.4-litres (Note: the block is original and the majority of ancillaries are present, so the car could easily be returned to original factory specification). 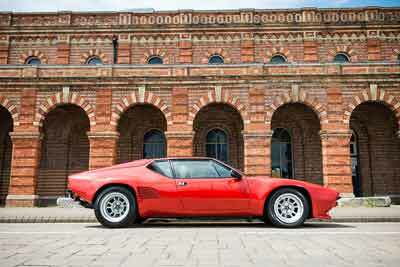 This rare Pantera carries an estimate of £100,000 – £120,000. 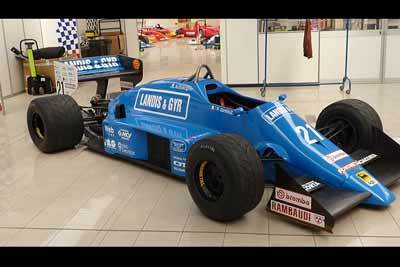 This 1999 LHD F1 transmission car was originally purchased in Kuwait but was used and driven in London when new. 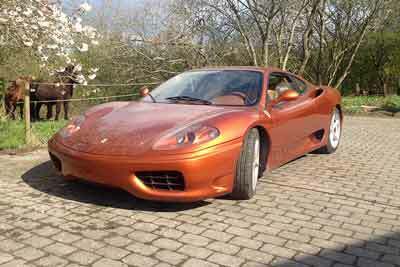 It is also the only Ferrari 360 Modena known to have been painted at the factory in Orange Flame. Having covered just 27,960 miles over the last sixteen years, the car carries a guide price of £38,000 – £42,000 (with Ferrari 360 values now heading north, this car could prove something of a bargain). Highlights of the first-ever stand-alone Silverstone Auctions Competition Car sale on 24th August include racing cars of all eras and budgets. From a 1998 BTCC Nissan Primera Super Tourer to a 1983 Osella-Alfa Romeo F1 car and 1977 March-Toyota Formula 3 car, among many others. From a 1998 BTCC Nissan Primera Super Tourer to a 1983 Osella-Alfa Romeo F1 car and 1977 March-Toyota Formula 3 car, among many others. The auction takes place at Silverstone Circuit in The Wing facility.